Dunwich House Hotel destroyed in a May bombing raid. 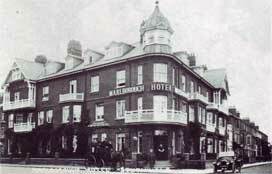 Dunwich House Hotel (the left-hand wing of the building) photographed between the wars. 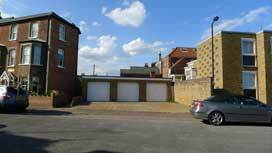 The much larger, Marlborough Hotel occupies the corner site between Dunwich Road on the left and Marlborough Road (then called Corporation Road) on the right. Both Hotels were destroyed in a bombing raid in May 1943. 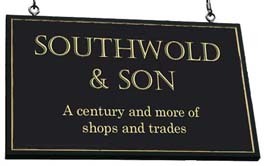 Reproduced from Barrett Jenkins book "Southwold Reminiscences through two world wars." by kind permission of the author's daughter, Ann Thornton. Wedding party outside the Dunwich House Hotel in April 1938. 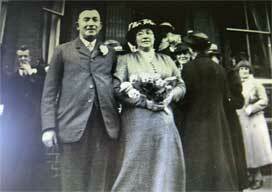 Bride and Groom are Ethel Mary Wright and Frank Rowe who is the son of the landlord of the Sole Bay Inn, East Green. Photos courtesy of their daughter, Heather Osmer.